Advice and tips when finding an injured, orphaned or displaced indigenous wild animal. 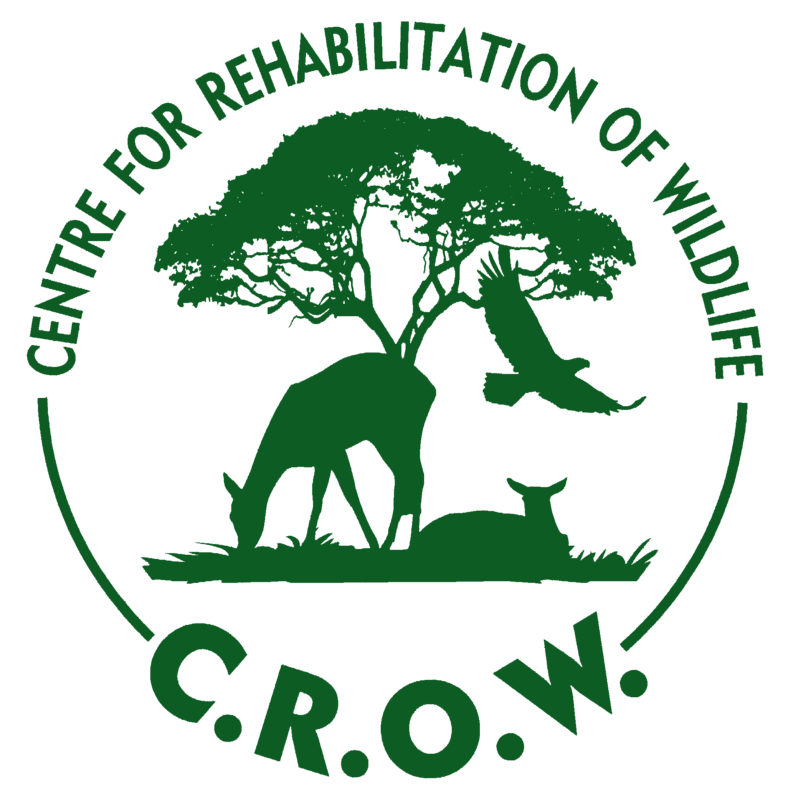 Please note that as a registered Wildlife Rehabilitation Centre, CROW is not authorised to investigate and/or prosecute cases of animal cruelty. All cases of animal cruelty in South Africa, whether it involves a domestic, farm or wild animal, must be reported to the SPCA. Please click here to read the NSPCA’s general guidance on reporting cases of animal cruelty. Please click here to download a copy of the Animals Protection Act. Should you wish to report the use of a pellet gun in your area, please contact your local SPCA and SAPS. Please Note: A person does not need a licence to own an airgun in South Africa, but the use of an airgun is regulated under the Firearms Control Act. When reporting the use of an airgun in your area to your local police station, we suggest you take a copy of the Firearms Control Act with you. Get the animal to CROW asap or call us on 031 462 1127 to collect the animal. CROW is open every day of the week from 07:00 – 17:00 with an after hours service from 17:00 – 20:00. To many, feeding a Monkey (or any wild animal) can be exhilarating, some even try build this relationship to enable them to feed by hand. While you may think you are helping them by giving them a meal, you are in fact doing more damage than you think. Human foods often contain non-natural ingredients which can be dangerous to a monkey’s digestive system as well as high sugar content leading to dental problems, obesity and in some cases diabetes. 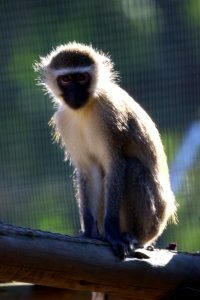 Zoonosis – monkeys are primates, just like us humans. This means they are susceptible to diseases that can be transferred from human hands. This puts them at risk from any disease or illness that can be passed onto them. This can work both ways! Monkeys are natural foragers and are more than capable of finding their own food source. Creating provisions can lead to a dependence on humans for food as well as interfere with their natural habits and upset the balance of their lifestyle centred on eating wild fruits, seeds, small animals, and insects. Creating food provisions for Monkeys, especially in the urban landscape, can attract monkeys to an area putting them at a higher risk of being hit by a car or being attacked by a domestic animal. Also, irregular feeding habits can instigate negative behaviour creating more opportunity for human/wildlife conflict situations. Provisioning and contact with humans helps to facilitate the poaching and the illegal trade of wildlife. As tempting as it is to feed your local troop, please consider the points above before doing so. If you are worried about the lack of food in your area, plant some indigenous fruit trees or chat to your local conservancy about planting if you don’t have space. If we don’t adjust our actions, we are setting up more opportunities for human/wildlife conflicts which leads to cruelty against these incredible creatures. Please take the time to explain this to your neighbours if you see them feeding, remember to be calm when explaining this as the aim is to educate, not alienate. For further info or queries, please contact us at info@crowkzn.co.za of on (+27)31 462 1127. Although many people consider these animals as pest, there should be a time dedicated to appreciate the beautiful waterbirds we sometimes take for granted – geese. As baby season is approaching, there has been an increase in wildlife nesting in our gardens. One increasingly common visitor to our gardens is the Egyptian goose, whose population numbers have been steadily growing over the past few years. But, did you know? The Egyptians believe these geese were sacred. As such they regularly featured in their artworks. With the population numbers steadily growing, CROW’s resources and facilities are being placed under severe strain, to the point that we had no choice but to start a waiting list for non-emergency cases, as we simply ran out of space. For those that are happy to have these feathered guests on their property for a few weeks and provided there is no threat from cats or dogs, it is advised you leave them be. It certainly can be a great experience for young children and an opportunity to teach them about nature. Of course, in instances where the Egyptian geese are in danger of being attacked by cats or dogs, then relocating them to a safer site may be the better option. However, given the sheer number of calls for assistance that CROW is currently receiving regarding Egyptian geese, CROW is appealing to the public to work with them in safely catching up families of geese that need to be collected and relocated by their team. It is a huge help if the home owner is prepared to lend us a helping hand by getting the family into any enclosed area such as a garage or shed before we arrive. This is relatively easy to do with a washing or laundry basket. 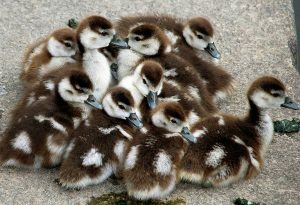 Gently scoop up each of the goslings and place them in the basket. Then, with mom and dad watching you, take the goslings and place the basket in your open garage or shed. Soon enough, mom and dad will make their way into the room to be close to their babies. As soon as they’re in, close the door and contact CROW to come and catch them. Let’s all work together in protecting and caring for these living beings – besides, it’s all about the goose!